Aerosmith is a prominent American rock band. Three of the members, Steven Tyler, Joe Perry, and Tom Hamilton first met in Sunapee, New Hampshire in the late 60's, but it wasn't until 1970, in Boston, Massachusetts, that the three decided to form a band together. Later they met up with Joey Kramer (drums) and Brad Whitford (rhythm guitar). The band enjoyed major popularity throughout the 1970's, with rock anthems like "Dream On" - but they split from 1979-84 due to serious substance abuse and drug addictions that contributed to their decline. The band enjoyed major popularity throughout the 1970's, with rock anthems like "Dream On" - but they split from 1979-84 due to serious substance abuse and drug addictions that contributed to their decline. The Grateful Dead's Jerry Garcia reportedly said they were "the druggiest bunch of guys I've ever seen." 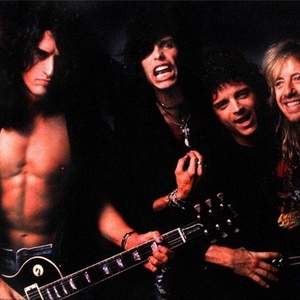 Jimmy Crespo replaced Joe Perry during those five years. However, in 1984, chiefly due to the tireless efforts of Joe Perry's then manager, Tim Collins, to reform the band, Aerosmith was born again. Despite his own client Perry's insistence that it was unthinkable, Collins succeeded in helping the band resolve old differences and ultimately overcome their addictions. By 1989, the band had completely stopped their drug abuse. They went on to enjoy a resurgence in popularity that has made them one of top-selling and most popular rock bands in the world today. Their greatest worldwide hit was "I Don't Want To Miss A Thing," from the blockbuster-hit movie "Armageddon". They have even infiltrated Disney Theme Parks in the U.S. and other countries with their own thrill ride 'Rock 'n' Rollercoaster featuring Aerosmith'. Continuing the ubiquitous marketing plan, they are also featured in their own version of the popular "Guitar Hero" video game. In 2010, the band suffered a setback, and an on-again, off-again break-up following an on-stage accident in which Steven Tyler broke his collarbone, but by mid-year, European tourdates were announced and the band went on. The Legendary Child Songfacts states that This was released as the first single from Aerosmith's fifteenth studio album, Music From Another Dimension!, which will be released on August 28, 2012 . The lead single was "Legendary Child," an unfinished piece originally put together in 1991 during the initial sessions for the Get a Grip album. The song was debuted live by the band on the finale of the eleventh series of American Idol on May 23, 2012.